Rainstorms passed through Bogalusa overnight, as expected, and the temperature dropped some 30 degrees. By the time we started off after 8 am this morning, it was just overcast and cool/cold. I had sent my fill-finger gloves home (since replaced with gardening gloves), but luckily I kept a long-sleeved wicking shirt. Can’t say I was toasty warm, but not cold either. Just 5 miles from Bogalusa, we crossed the Pearl River into Mississippi. We celebrated a new state tonight with margaritas. 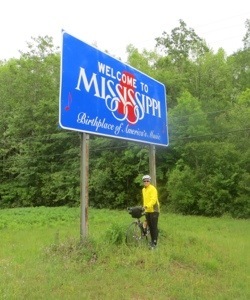 My legs noticed that roads in Mississippi were more undulating than in Louisiana – my climbing speed has not increased, though no walking today. We have been having trouble with loose dogs – and a black Lab came awfully close to biting us today. The adrenaline kicked in and Donna rocketed ahead with quickened heart rate. I have now bought a referee’s whistle, hopefully to deter. 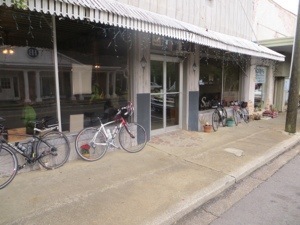 At mile 28, we rode into Poplarville, the only town noted on our cue sheet that had services (read food). 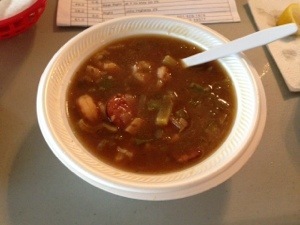 We enjoyed yummy gumbo at Scooter’s in an old hardware store. 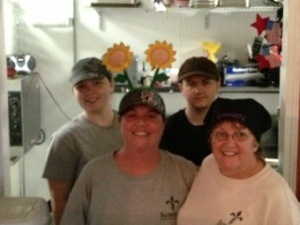 Chemin (with floral antennae), Mary Jo, Sissy and Jacob took good care of us and we warmed up nicely. 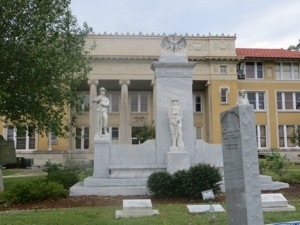 The Pearl River County Courthouse was also in Poplarville. 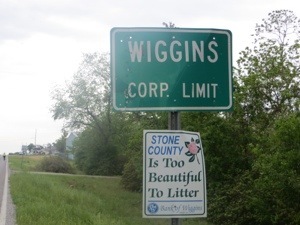 We are staying overnight at a Best Western in Wiggins. 61 miles on cue sheet + 2 bonus miles round trip to Wal-Mart. Dolly after Gulf Shores-Orange Beach, yo need to stop at FlorBamafor a cool one.